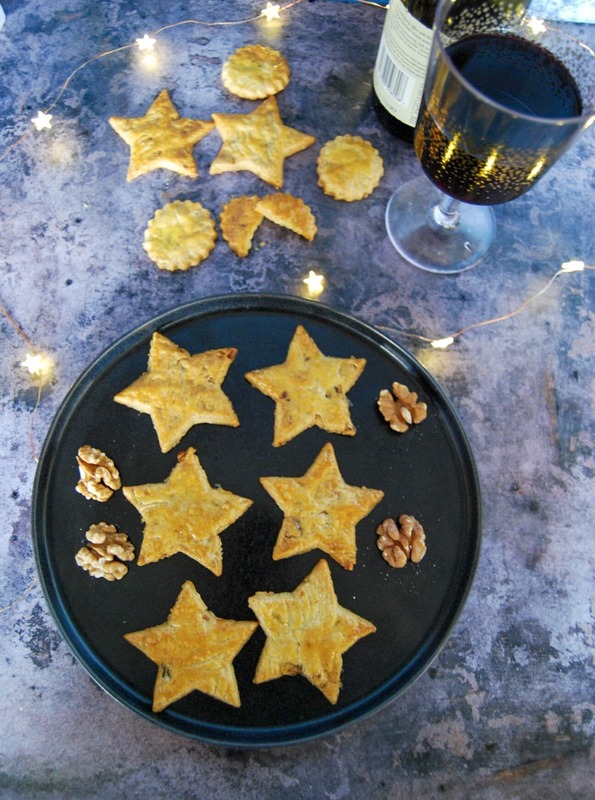 These stilton and walnut star biscuits look so festive and would be perfect for a New Year’s Eve celebration! I don’t throw a party or go out on New Year’s Eve. After far too many anti-climatic nights out in my twenties, I’m more than happy to leave the partying in the New Year to the young ones. I’m well aware this makes me sound ancient, but I don’t care. I put on my cosiest pyjamas, make myself a fancy cocktail and rustle up a few yummy treats to stuff my face with while watching a movie. I usually have a couple of chocolate oranges leftover from the Christmas stockings, so more often than not I’ll make my Terry’s chocolate orange brownies or this creamy, no bake Terry’s chocolate orange cheesecake. I don’t usually make a proper dinner on New Year’s Eve – although this year, my pigs in blankets macaroni cheese is a hot contender! I often end up doing a small buffet – little sausages, sausage rolls, sandwiches, breadsticks, dips, these cheesy stars and crisps. I can’t tell you how addictive these cheesy biscuits are – and you honestly don’t need to be a blue cheese lover to enjoy them. My boys can’t stand stilton but they absolutely love these biscuits. 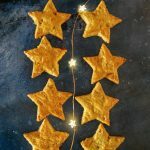 Just like these other cheese stars, they are a breeze to make – just a quick mix of the ingredients, a brief chill in the fridge while you heat the oven and prepare the trays and you’re good to go. 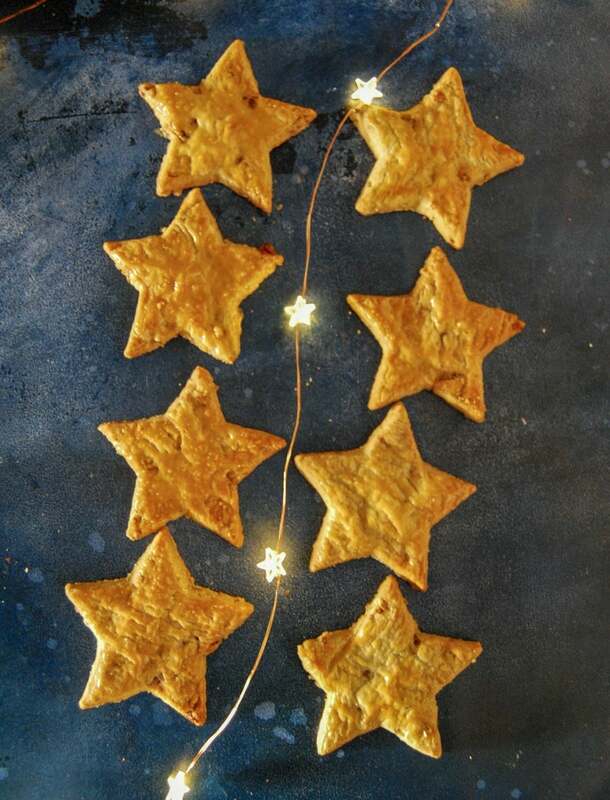 Of course, you don’t have to make star biscuits – any shape you want to do would be fine. I often just use a small fluted round scone cutter – they look a little bit like ritz crackers when baked! Make sure your butter is really soft before mixing with the other ingredients – this will ensure the dough comes together nicely. Chop your walnuts quite finely – if the pieces are too large the biscuits tend to fall apart. You don’t have to glaze the biscuits with egg yolk before baking, but they do give the biscuits a lovely golden sheen. You could sprinkle the biscuits with seeds before baking – pumpkin, sesame or poppy seeds would be a nice addition. This recipe was originally published 8th December, 2014. Republished on 31st December 2018 with new photographs and more text. Place the soft butter, stilton, flour and chopped walnuts in a food processor or mixer. Process until the dough is just starting to come together but don't process beyond that point. Tip the dough out onto a lightly floured work surface and briefly knead to bring together to a soft dough. Wrap in cling film and place in the fridge for about 30 minutes. Preheat the oven to 200C. Grease and line a couple of baking trays. Roll the dough out on a lightly floured work surface. 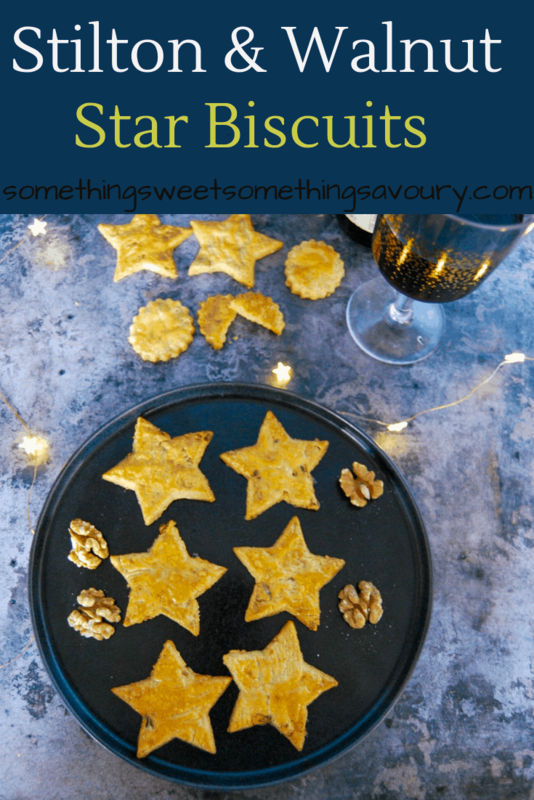 Cut out star shapes (or any other shape that takes your fancy) and arrange on the lined baking trays. Glaze with the beaten egg yolk. Bake for 10-12 minutes or until golden and firm. Absolutely saving this recipe for an upcoming tea party. I love a unique savory biscuit recipe! OK so I am drooling right now. Pass me a bowl of these and a glass of red wine please! Too late for New Year but I would love to make these to serve with pre dinner drinks. Too late for New Years Eve but I would love to serve these with pre dinner drinks at anytime of the year I am sure they would go down very well. Thanks and Happy New Year to you Jacqui ? These biscuits are perfect for pre-dinner nibbles!